LEAP Sports > News > Dream of joining the Circus? As part of this year's Festival Fortnight, Adventure Circus are holding a workshop for people wishing to try out some aerial acrobatics and other circus skills such as hula hooping, juggling, spinning plates, and partner acrobatics (balancing on each other). 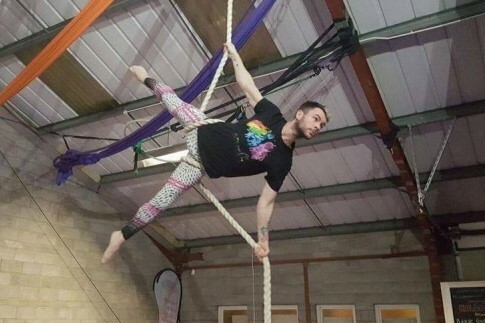 This workshop is designed for people of all capabilities and ages (well...14+ ish...) to give you a taste of how fun and energising (and a bit of a workout) aerial circus can be! Try your hand at trapeze, silks, aerial hoop, and acrobalance. Learn with a friendly team of instructors who will ensure you have a safe and enjoyable time up in the air, and don't worry....it's not too high! Following the workshop, our crew will be putting on a mini show inspired by the 80s workout genre....cheerful and colourful! Featuring guest performances from Tyrone Herlihy and Thistle Suite. Tyrone Herlihy is a London based aerialist who has successfully auditioned and obtained a place in Cirque Du Soleil's casting books. Both strong and flexible he will have you (and us) thinking 'how did he.....what is he....wow!" Thistle Suite is a Glasgow based drag queen who we have previously worked with. She provides witty banter and a fierce attitude, and will be joining you to participate in the class. The session only costs £5 and places are limited so get booking now. Written on 23rd April 2017.